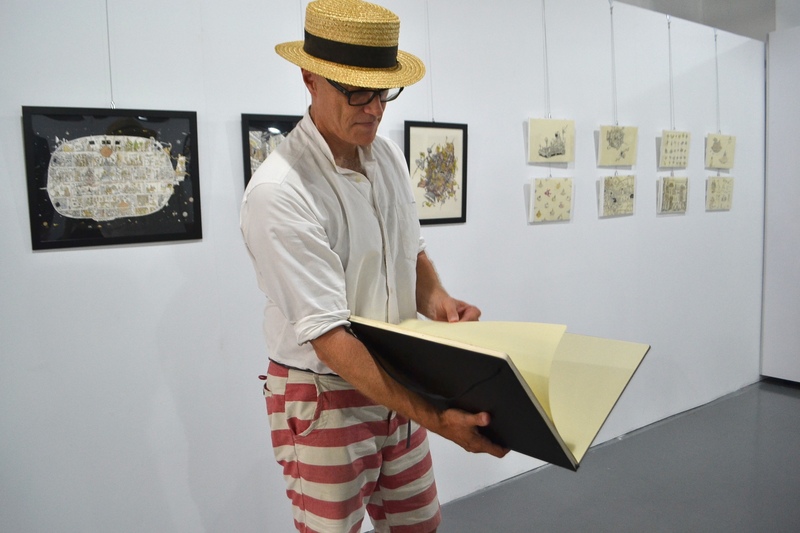 Dressed in a white shirt, red and white striped shorts and a boater, Swedish illustrator Mattias Adolfsson carefully examines a blown up replica of his drawing “Night Flight”. He’s in Taiwan as a special guest for the 2015 Taoyuan Illustration Exhibition, which is themed around the topic of space. It’s Adolfsson’s first time in Asia. He landed only the afternoon before but managed to squeeze in a stroll in downtown Taipei after checking into his hotel. “In the beginning when you come to new countries, there’s just so much to see, but I really feel that there is some kind of energy in the city,” he says. Besides the obvious weather differences from Sweden, Adolfsson quickly pointed out the vibrancy of the capital – and the number of people on the streets. It’s these minor details that intrigue him, and why travel is such a large source of inspiration for him. At home, he’s bogged down with the commissions, mundane emails and day-to-day correspondences just to keep his company running. “But when I go abroad, I can let that go, and all the small, new details that are different from my country – I try to store it and hopefully it’ll come out in my drawings,” he says. While he could have just stayed for the exhibition opening, Adolfsson decided to extend his trip for a week so that he could take in the sights. “I feel really handicapped though, because I can’t even say hello or thank you,” he says. I offer to teach him how to say a few short phrases, and he takes out his sketchbook, diligently spelling out the characters phonetically. 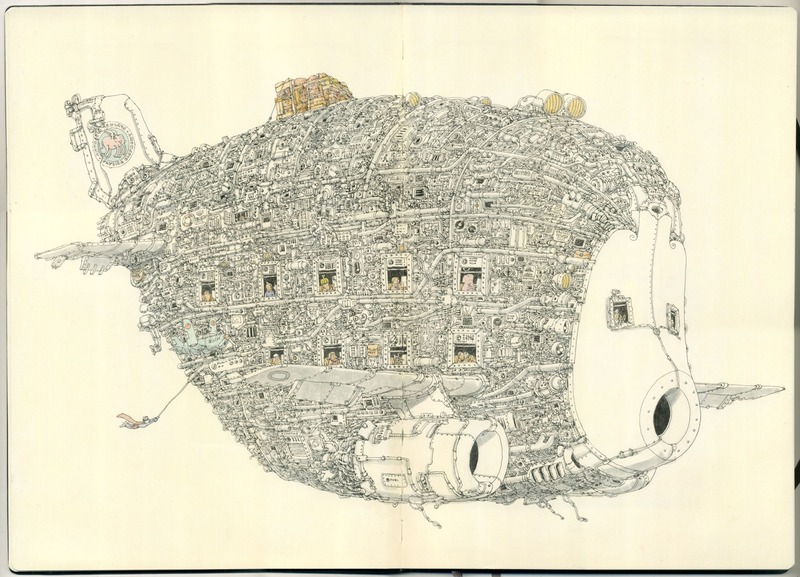 Adolfsson is never without his sketchbook; whenever he has a free moment, he is drawing, the black-cover moleskine filled with convoluted contraceptions, intricate machinery and small comedic sketches, all drawn in ink. 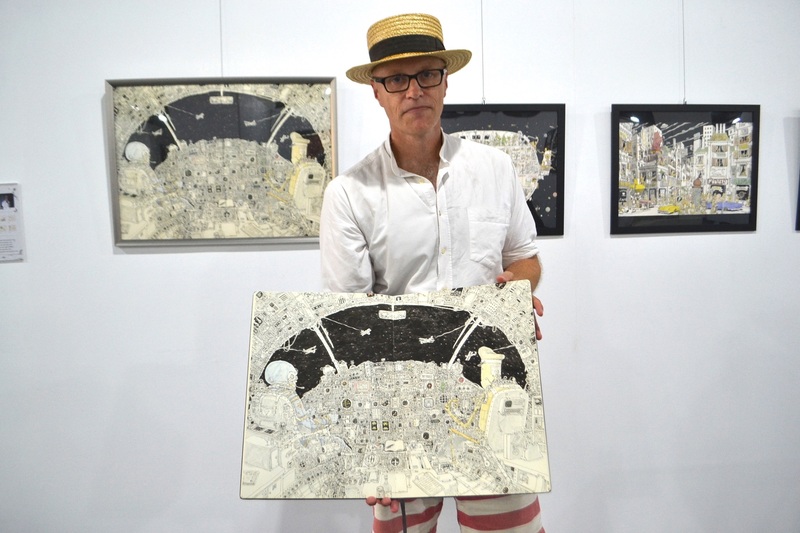 He pulls out a larger moleskine, showing the breathtakingly detailed original of the aforementioned “Night Flight”, which serves as the main visual for the exhibition. Pieces like this take him an average of 30 hours, or a week, to complete. Originally studying to be an engineer, and then an architect, Adolfsson spent ten years in the computer games industry. 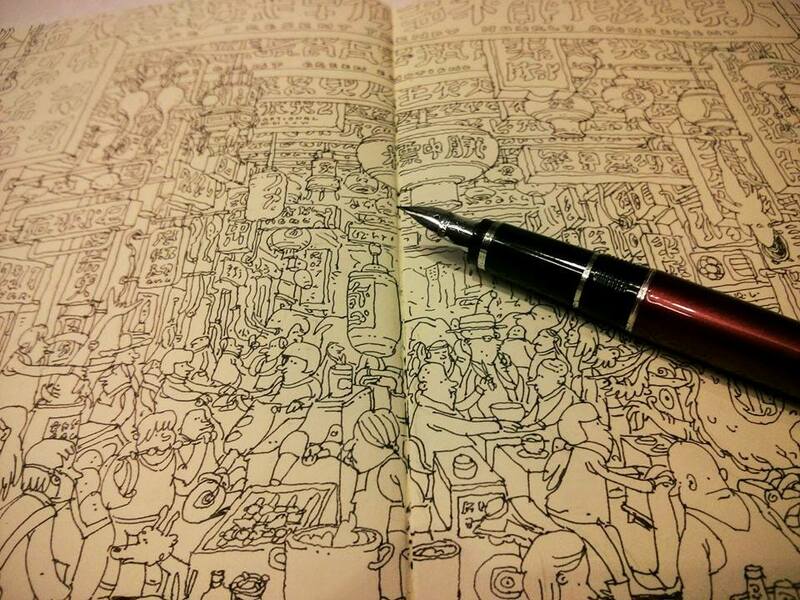 He never thought he’d be able to make a career out of illustration. He considers this one of his proudest achievements. Since then, he’s gotten commissions from Wired to Disney to the New York Times and the New Yorker, American magazines he grew up watching his “grandpapa”, who studied in the States, read. For him, mathematics and drawing are inseparably tied; it’s easy for him to conjure up complex machinery, and he brings to his drawings an analytical aspect seen only in engineering and architecture. Despite the seemingly controlled nature of his work, Adolfsson describes it as “loose, sloppy and tight,” when asked to do so in three words. It sounds pretty contradictory, but he’s quick to explain and it makes total sense. His illustrations may look like the product of deliberate, mechanical planning, devoid of any misplaced shapes or lines crucial to the operation of the piece as a whole, but are, in fact, filled with errors. And if there’s any meaning, it’s up to the beholder to see, he says. Next to us, volunteers scramble to put the finishing touches on the exhibition, sanding down frames, tacking up signs, dangling plastic terrariums encapsulating whole worlds. “I think it’s a constant fascination – space – part of it because anything is possible; you’re not confined to reality,” Adolfsson says. An avid sci-fi fan when he was younger, he’s drawn pieces inspired by his favorite sci-fi flicks Solaris and the first trio of Star Wars films but is always able to invent something new when it comes to space, Adolfsson says. During this process, he’s accompanied by music, audio lectures and podcasts– anything but a quiet room. He dabbles in all sorts of music, used to listen exclusively to rock’n’roll, but electronica is his thing. At the moment, he’s tracing (metaphorically) techno to its roots in Detroit and the early house scene to Chicago. He’s unable to look at a piece and pinpoint the exact song or type of music he was listening to at the time. “Unfortunately,” he adds with a laugh. “That would be interesting though,” he muses. Sometimes ideas come to him in an almost literal “bolt of inspiration”, but most of the time, he starts from the top of the page, and new ideas come to him as he works his way down. His process is so subconscious that he tends to forget the piece after he’s done it, he says. Small details do, however, make themselves into his works – historical elements from a podcast about antique history he was listening to (Adolfsson considers himself a history buff) or specific texts from a science audio lecture. It’s a skill he picked up from Tove Jansson, the Finnish author and illustrator best known for the Moomin books, who Adolfsson has cited repeatedly as influential in shaping his own storytelling and style. In general, although he doesn’t like to look to other illustrators or his contemporaries for inspiration for fear of inadvertent plagiarism, he is rather fond of Janssen, as well as the French and Belgian comics of Asterix and Hergé’s Tintin respectively. Jansson, he says, always has multiple things going on in the background of each drawing, teaching him to always bring a lot of stories to his drawings. She created her own universe; he, his own reality. It’s a place where tiny animals are capable of pulling along buildings ten times their size and a world in which Adolfsson wears a yellow robe, his color of existential choice. It’s interesting, as in his home country, illustration is not perceived so much as ‘art’, as, say in France or America, Adolfsson says, speaking of a “big rift” between the different fields. A lot of art is very much part of the zeitgeist, Adolfsson says. Very few piece survive their time, but illustrations made hundreds of years ago continue to endure. Looking back, Adolfsson says wishes he had started doing illustration earlier; he advises aspiring artists to “take care of time,” as it takes a lot of time to become really good at something. “The earlier you start, the better, so don’t spend too much time playing Candy Crush,” he adds, laughing. As for him, he’s got a carefully-planned itinerary for his trip, is eagerly looking forward to seeing some of the interesting things he’s read about the art scene in Taiwan and heading to a food market to get a taste of the famous Taiwanese food and, of course, bubble tea. So can we expect any work from him about Taiwan in the future? 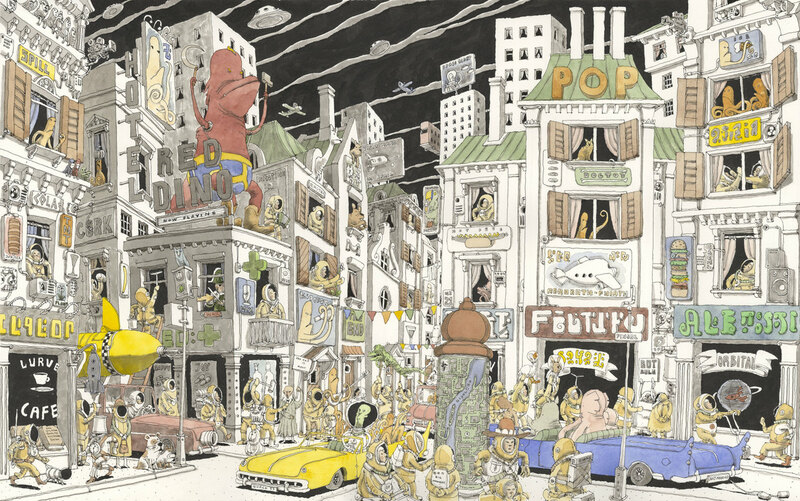 The 2015 Taoyuan Illustration Exhibition will run from August 27 through September 27 at the Taoyuan Arts Center. Entry is free.